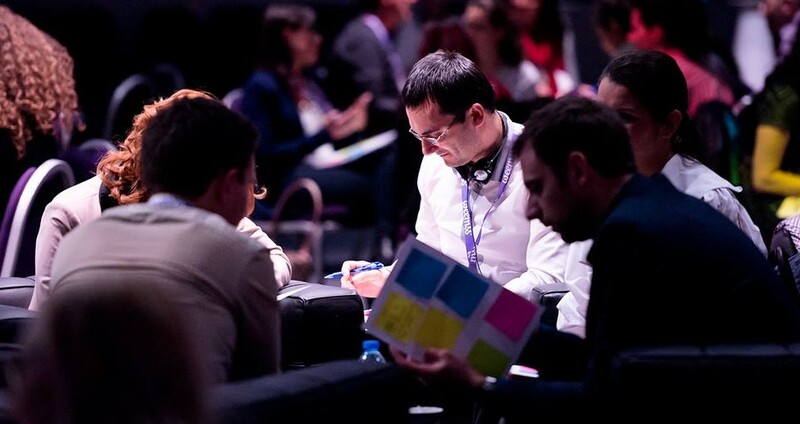 As event organizers, we are constantly searching for new creative meeting formats that will wow our audience. We all want to move beyond the one-size-fits-all, been-there-done-that sessions. We want to bring our participants a powerful and engaging learning experience. 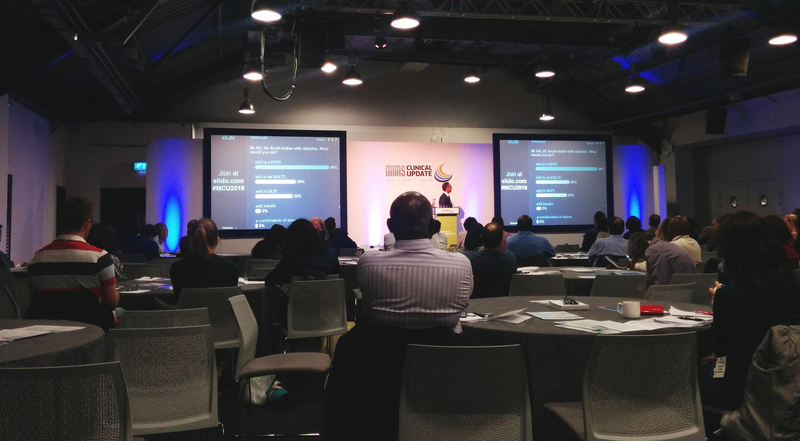 Having worked on more than 160,000 events, we’ve had the chance to visit hundreds of conferences and attend thousands of different sessions. From what we’ve seen at these events, we hand-picked seven sessions that stood out for their creativity, bursting interaction and skillful use of Slido. In each of these cases, the result was an immersive session that made an impact on participants, their engagement with presenters and their overall learning. For startups and VC investors, pitching events are an indispensable part of life. Startups attend them to get feedback and secure investment. Investors and participants fancy them as they can get exposure to a lot of new ideas in a relatively short time. However, to make the pitching events meaningful for both sides, it’s necessary to set up an effective backchannel that will connect the founders and the audience. During Google Demo Day 2016, the organizers decided to use Slido to help them achieve the following interaction goals. As we all know, pitching competitions run on a tight schedule and the audience is usually left out of the conversation. The Google Demo Days organizers, therefore, used Slido to let the onsite, as well as online audience, ask questions and send comments while the teams were pitching onstage. Being equipped with tablets, the judges were able to view and ask top questions on behalf of the audience and thus maximize the effectiveness of the 5-minute Q&A time. Knowing that their questions might be addressed, participants were eagerly interacting, asking more than 160 questions throughout the event. In addition to collecting questions from the audience, the organizers also used live polls to help startups gain feedback on the specific problems that their companies were trying to solve. The poll questions were activated during the pitch adding another layer of engagement with the presented ideas. A good pitching event isn’t complete without appointing a winner. In addition to the official winner selected by the judges, the event organizers empowered the attendees to appoint their people’s choice. To do that, the organizers created a poll with a list of pitching startups. Once all the pitches were over, the organizers activated the poll and let people vote for their favorite team. By sending in over 650 votes, participants appointed a winner of the Game Changer Award. When organizing a pitching competition at your event, crowdsource questions from the audience to give startups a chance to address what the participants are interested in learning about their projects. Use live polls to engage people while also generating valuable feedback for the pitching teams. Finally, let people appoint their favorite idea with the final vote to keep them on the edge of their seats throughout the whole event. 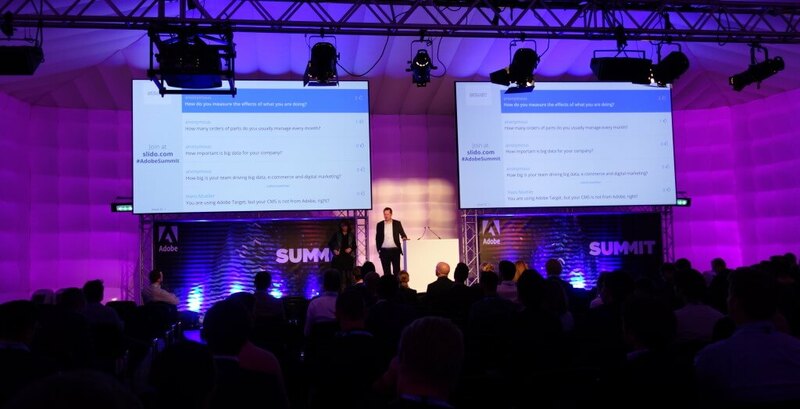 At many traditional conferences, Q&A sessions are often the only time dedicated to audience interaction. And even then, they are rarely handled to their fullest potential – people don’t have questions, many say. But they do. You just need to give them space and time to formulate them. At the Eventex conference, moderator Jan-Jaap got the audience to come up with questions before the talk. Before the speaker opened her presentation, he encouraged the participants to write down three questions on a piece of paper. During the presentation, they were to tick off the topics that the presenter addressed. Once she was through with her talk, Jan-Jaap prompted participants to submit the unanswered questions via Slido. After 1-2 minutes, the questions started pouring in and people automatically upvoted the ones they found most relevant. Then Jan-Jaap asked the speaker the three questions with the highest number of votes. This way, he ensured that the most burning topics were addressed during the 10-minute Q&A session. Include a few moments for reflection so your audience can prepare its questions. By doing this, you will ensure that there are plenty of them when the Q&A time comes. No awkward silence guaranteed. Also, encouraging people to upvote the submitted questions will help you maximize the effectiveness of the Q&A time by addressing the most burning topics. A growing number of speakers are using live polling to energize presentations and gauge the participants’ stances on the given topics. In many cases, live polls still only complement a slide deck. But there are also experienced presenters who completely replace their slide decks with live polls to create truly immersive experiences. 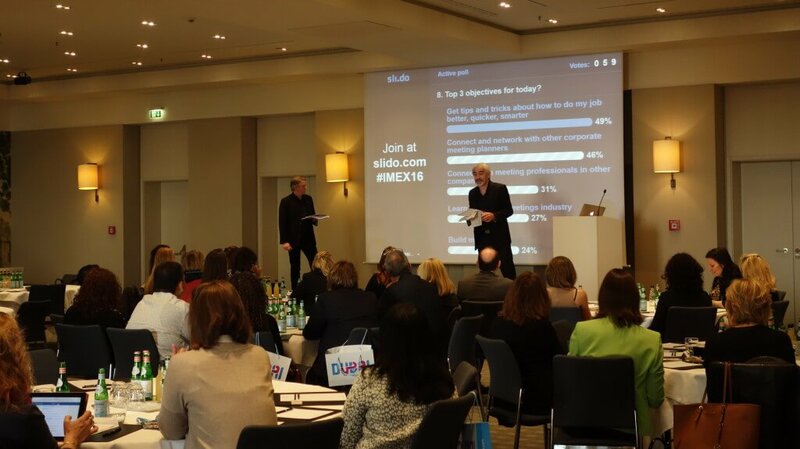 At the IMEX Exclusively Corporate session, presenters Padraic Gilligan and Patrick Delaney from SoolNua ditched the presentation tools in favor of live polls that they used to deliver their message and make everyone in the room feel involved. They began their talk with two icebreaking polls to make people feel comfortable with the tool as well as the session format. As the votes came in, they commented on the results, providing extra context to the topic and loosening up the atmosphere. Next, they moved on to more industry-specific polls such as, How long have you been in the meetings industry and what is your role in the organization? This allowed Padraic and Patrick to highlight how much knowledge was present in the room and encouraged the participants to use this opportunity and learn from one another. After that, Padraic and Patrick used Slido to crowdsource the greatest challenges that the participants wanted to hear addressed during the session. Participants brainstormed in groups, then submitted and collectively upvoted the key areas. During the World Cafe session at the end of the day, groups were created based on the crowdsourced topics. Participants could then choose three different topics and discuss them in a small group for 15 minutes. When integrated well, live polls can be much more than a tech gimmick. Use them to open your event, introduce speakers, or if you have an innovative facilitator, suggest ditching slides in favor of polls. For more inspiration and real examples of polls, make sure to check out this article. If you organize an event with multiple tracks, your attendees will sooner rather than later face the dilemma of which session to attend. In most cases, they make the decision solely on their gut feeling and a brief description in the agenda. So how can you help them? It’s hard without introducing the speakers properly. The organizers of Dell’s #Social360 UnConference at SXSW came up with a brilliant idea to help the audience get to know the speakers and their topics. Not only was the introduction super-engaging, it also helped people get their bearings. The event started with a survey game that people are familiar with from popular TV trivia games. The presenters were divided into two teams and the host asked a series of questions based on the pre-event survey and let teams guess the right answers. As on TV, the team which hit the buzzer fastest was allowed to answer first. If it guessed one of the top three answers from the survey results, it gained points. To make the game more informative, the moderator asked a large number of follow-up questions to enable presenters to demonstrate their knowledge and expertise. The other advantage of posing questions openly is that it got people to think about the topic and take a guess themselves. It effectively uncovered knowledge gaps that needed to be filled in later during the day. And finally, this session also offered delegates a great overview of the topics and allowed them to select the speaker from whom they wanted to hear more. If possible, introduce your presenters to the audience right at the beginning. Take inspiration from the use case above and make it similarly fun and engaging. Not only will this help your delegates compose their schedule, you will also generate more exposure for your presenters. Since many presenters often agree to speak about the promise of building new contacts, they will appreciate it immensely. According to meeting designers Mike van der Vijver and Eric de Groot, meetings are like theater plays. With the presence of a stage, lighting and speakers who closely resemble actors, participants are temporarily involved in a different reality, in a story. Whether you can identify with this analogy or not, there’s a lot that people can learn from the drama. 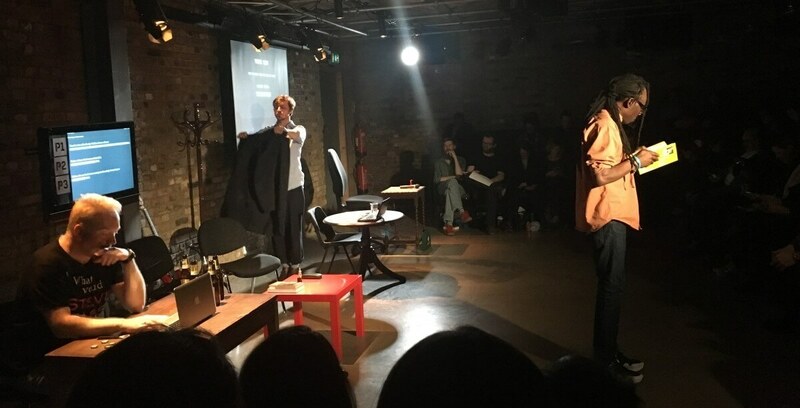 We were thrilled when interactive theater, Arcola Theatre, used Slido in a play to involve audience members and make them a part of the story. The play’s title was ‘Technically Speaking’ and it revolved around stories of men suffering from mental health illness. The goal was to raise awareness of mental health issues and get audience members to come away with their version of the story, depending on how much, or how little, they wanted to involve themselves. To help participants get the most out of the show, the actors used live polls to help each attendee to take a moment and contemplate questions related to mental illness, which was the overarching theme of the play. The results of each poll were then displayed on a screen so the participants could clearly see where the majority of the audience shared the same viewpoints and where the opinion was divided. Also, how their individual opinion stood in the context of the general opinion. People crave for inclusion. Live polls allow you to include tens, hundreds or thousands of participants at the same time, hear out their opinion and show individual stances in the context of the general opinion in the room. Making live polling contextual is key, try to come up with polls that correlate with the theme of your event to make people want to participate. Generating participation at medical conferences is tough. Presentations are content-heavy. And presenters feel obliged to elaborate on details, which often results in a one-way information delivery. So how do you transform this traditional format in the way that would involve participants and help them learn better? Haymarket Media, the organizers of the MIMS Clinical Update Conference came up with a genius idea. Instead of letting their presenters —general practitioners—just broadcast their learnings, they used live polls to allow participants to actively engage with the presented information. The medical experts presented a series of pictures with patient conditions and introduced potential remedies. After this introduction, the experts showed audience members photos of medical cases and asked people to choose the best treatment via live polls. Not to bias people’s responses, the presenters let people cast their votes first. And only when the votes were in, they displayed the results. The speakers then analyzed results and provided further advice on how to treat the illnesses. The participation rate was impressive with over 1800 votes in 70 polls. In addition to live polling, the MIMS organizers also used Slido to allow people to ask questions anonymously during their Q&A sessions with speakers. Health is always a sensitive topic and even doctors might refrain from asking questions about health conditions openly. Thanks to the anonymous feature, general practitioners in the audience asked almost 250 relevant questions without feeling uncomfortable. Knowing specific questions that worried the audience helped significantly improve the quality of the discussion time. In order to fully internalize new knowledge, give your delegates some time and space for reflection. Polling delegates, as described in the MIMS Clinical Update example above, allowed event organizers to involve their participants in the learning process, got them to actively think about their responses and as a result helped them to better process the newly-acquired knowledge. Making the introduction of new features interactive can be a real challenge. 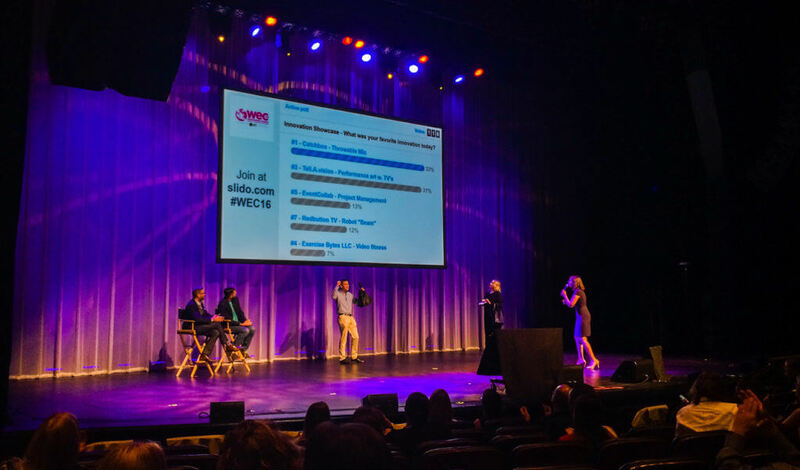 The director of one of the leading Analytics tools masterfully combined feature demonstrations, live polls and onstage interviews with participants to turn his product update session into one of the event highlights. First, he intended to show the new features which the Analytics developers had sweated over. Second, he hoped to gain real-time feedback from about 400 participants present in the room. After introducing the outline and objectives of the session, the director gave the stage to two of his colleagues who introduced individual features. While the features were being presented, the audience provided its feedback through the open poll submissions. Each input included the person’s name, feature, and the comments so they could be identified later. One of the directors’ colleagues monitored the incoming inputs and copied them to a separate sheet where he sorted them out. As soon as the feature demos were over, the director let the audience members vote for the feature they found most useful via an open poll. Based on the results, the colleague who had been sitting in the audience to this point stepped out and called out two participants with the best comments endorsing the two winning features. Incentivized by some prize money, they elaborated on their comments while the director was bringing in more input from the audience. To conclude the session, the director ran the final poll to give the audience a chance to select the top feature. With survey response rates progressively dropping, running a live poll is a unique opportunity to effectively collect feedback from 50, 100 or 500 experts attending your session. Having an open poll allows you to collect longer, more elaborate feedback that can be used for further analysis. Not only can you collect valuable ideas with polls, but you can turn otherwise mundane introduction sessions into an engaging experience.